Geneva (AFP) – More than 920,000 people were displaced inside Syria during the first four months of 2018, the highest level in the seven-year conflict, the United Nations said Monday. “We are seeing a massive displacement inside Syria… From January to April, there were over 920,000 newly displaced people,” Panos Moumtzis, the UN regional humanitarian coordinator for Syria, told reporters in Geneva. “This was the highest displacement in that short period of time we have seen since the conflict started,” he said. 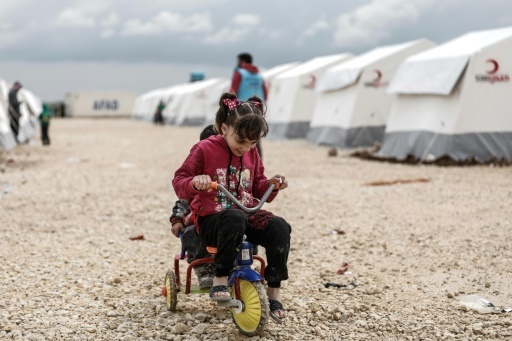 It brings the number of people internally displaced in the war-ravaged country to 6.2 million, while there are still some 5.6 million Syrian refugees in neighbouring countries, according to UN figures. Moumtzis said most of the newly displaced had been forced on the move by escalations in fighting in the former rebel bastion of Eastern Ghouta and within the northwestern province of Idlib, which is almost entirely controlled by various jihadist and hardline rebels. His comments came after several deadly air strikes in recent days in Idlib that have left dozens of people dead, including children. 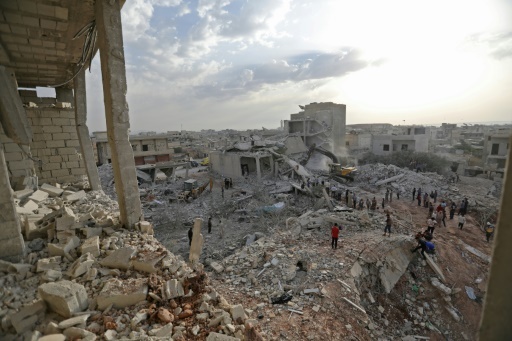 He said Idlib is part of the “de-escalation” agreement for Syria reached between Turkey, Russia and Iran, and warned of the dire consequences if the province, which has some 2.5 million inhabitants, sinks into full-blown conflict. More than 350,000 people have been killed since the Syrian conflict erupted in 2011 with the brutal repression of anti-government protests. But Moumtzis said “our worry is that with the Idlib situation, we may not have seen the worst of the crisis in Syria”. He said the world must “make sure that we don’t see a similar scenario as we saw in Eastern Ghouta,” which was recaptured in April by the Syrian government after a blistering two-month offensive. “We worry about seeing really 2.5 million people becoming displaced,” he said, adding that the UN was currently drawing up a range of contingency plans in case the situation escalates. “We are on high alert,” he said. Following the Eastern Ghouta offensive, and the previous offensive to retake Syria’s second city Aleppo, rebels and civilians were forcibly evacuated to Idlib. AFP/File / OMAR HAJ KADOUR. Several deadly air strikes in recent days in Idlib have left dozens dead, including children. But for the people of Idlib, “there is no other Idlib to take them out to,” Moumtzis said. At the same time, the mishmash of armed groups in the province are increasingly fighting amongst themselves. “The current composition makes (the situation) highly explosive,” Moumtzis warned. Elsewhere in Syria, he said the numbers of people stuck in besieged or other areas humanitarian workers cannot easily access has shrunk dramatically since last year to just over two million people. But he said far too few aid convoys were making it through to such areas, with only nine succeeding since January. The UN, he said, has the capacity to send in at least three convoys a week, so it has made only 11 percent of possible deliveries this year — “the lowest ever” since the start of the conflict. A convoy carrying food aid for 60,000 people finally made it to Douma in Eastern Ghouta on Sunday, he said, the first UN aid delivery there since March 14. Elsewhere, access is easier and the UN is currently providing aid to some 5.5 million people across the country each month. But Moumtzis voiced deep concern over the lack of funds for the massive aid operation, with only 26 percent of the $3.5 billion needed inside Syria this year materialising to date. Feature Photo: AFP/File / Sameer Al-Doumy. The number of people internally displaced in Syria is 6.2 million according to UN figures. Nina Larson is AFP's Geneva correspondent. Her journalism has also appeared in France 24, Japan Today, Business Insider, Yahoo, AlterNet, La Presse, Business Day, Mail & Guardian, and The Times South Africa.